MPG-o-Matic Toyota Tacoma Double Cab 4X4 Review Summary: The 2009 Toyota Tacoma competes with the Ford Ranger, Chevy Colorado, GMC Canyon, Dodge Dakota, and Nissan Frontier in the mid-size pickup truck market. The four-door short-bed Tacoma Double Cab 4×4 offers car-like comfort and convenience in a truck that begs to be driven both on and off the beaten path. Under the hood, the Tacoma Double Cab is equipped with a 4.0-liter V6 engine which produces 236 horsepower (HP) and 266 foot pounds of torque. The V6 can be mated to five-speed automatic or six-speed manual transmission. The official mileage estimates for the automatic-equipped 2009 Toyota Tacoma Double Cab 4X4 are 16 city / 20 highway miles per gallon (MPG), and 17/20 when fitted with the manual transmission. We rolled up over five hundred miles on our automatic-equipped Timberland Mica review unit. As always, we drove conscientiously with a light foot. We were able to fly past the Tacoma’s official estimates, with an average of 24.2 MPG on the Interstate highway and 19.5 MPG combined with no load. Test period temperatures ranged from the sixties through the seventies. The Tacoma does not provide an instant fuel economy gauge. 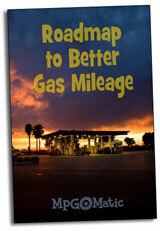 We recommend adding an aftermarket unit to provide the feedback you need to achieve the best possible gas mileage. Our Tacoma was equipped with the TRD Sport package, which includes a sport suspension with Bilstein shocks, 17-inch alloy wheels, 265/65R17 tires, and that way cool (and easily made functional) hood scoop. It was also was equipped with the 6,500 pound-rated V6 Towing package, which includes a Class 4 hitch, transmission and supplementary oil coolers, 130A alternator, and a heavy-duty battery. While the V6 delivers adequate power to hustle the Tacoma along, a dealer-installed factory-supported supercharger is available for folks who just can’t get enough. The Tacoma 4×4 provides four-wheel-drive on demand, with a part-time 4WD system and 2-speed transfer case, A front skid plate is standard. Options included with the TRD Off-Road package include: Hill Start Assist, Downhill Assist, Active Traction Control, an electronically controlled locking rear differential, and an engine skid plate. 4-wheel anti-lock brakes (ABS) are standard equipment. The Double Cab’s versatile short bed includes a composite inner bed, along with Toyota’s handy rail-based adjustable tie-down cleans, and a pair of cubbies. A 115V/400W power outlet is included with the TRD package. The bed might be short, but the cabin is long on comfort and convenience, with steering wheel audio controls, two power outlets at the base of the dash, and an auxiliary audio input along with manual driver seat lumbar support (with the TRD package’s Sport bucket seats). Unfortunately, we found that the standard six speaker audio system lacked oomph. While a beefed up JBL audio system with a subwoofer, XM Satellite Radio, and Bluetooth is available as part of the TRD Extra Value Packages, we were not able to test it. The various TRD packages include a host of sweet features, including a rear view mirror with a built-in small video screen, fog lamps, and a sliding rear window. The rear view camera’s diminutive and stealthy display eases the chore of backing up. All-in-all, our week long test drive found the Toyota Tacoma Double Cab 4×4 to be highly accommodating for both driver and passengers, both front and rear, as it delivers decidedly car-like ride and comfort, along with reasonable fuel economy and all the utility of a mid-size 4×4 pickup. i am trying to find out if i can tow the toyota tacoma four down behind my motor home. if so, do i need to do anything extra in order to do this?